When I saw this recipe for Spiced Apple Cider, it reminded me of the Vin Chaud (mulled wine) I’d had and loved in Europe during the holidays. I could often smell it wafting from doorways of small restaurants and upon entering friends’ homes or churches. Even places like train stations and gas stations served it, which cheerily sustained me through the cold winter months. I remember when Ani got the inspiration for this cider, and I thought it would make a perfect cocktail recipe for a New Year’s celebration in wine country. I could please everyone: plain cider for the mocktail drinkers, spiced wine for the wine country fanatics and cider with vanilla vodka or rum for the most festive of friends. I tested it out in preparation; following the recipe was easy…so much easier than the homemade eggnog I’d recently tried out. You just need spices and apple juice for the base, and it only takes 15 minutes of cooking time. I also decided to chill some of the plain cider after cooking to satisfy those that might want their cocktail on the rocks. 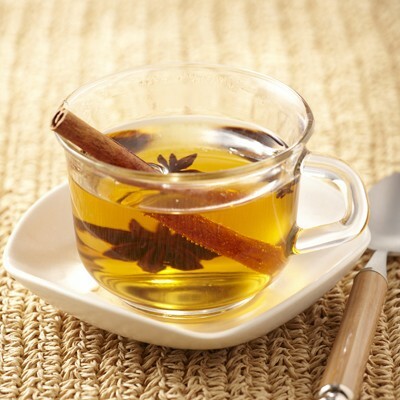 Add vanilla vodka or rum (or your favorite spirit) to the hot cider. Add your favorite spirit to chilled cider along with a splash of carbonated water over ice. For mulled wine, substitute 1 bottle of medium to full-bodied red wine for the apple juice, add 1/4 cup sugar, cover immediately and cook on low (so it never reaches a boil) for 20 minutes. For white wine cider, substitute 1/2 bottle of medium to full-bodied white wine for 1/2 of the apple juice, add 1/8 cup sugar, cover immediately and cook on low (so it never reaches a boil) for 20 minutes. For me, this will make the cheeriest, easiest and most versatile of winter celebrations. Happy New Year! If you’re looking for something creamier, fancier or more holiday-themed, check out this old-fashioned eggnog adventure (pictured above) and the coffee-creamy-martini or latin-inspired eggnog below.